The Sioux Falls Regional Landfill will accept them separate from your trash for proper recycling. Local scrap recyclers like TJN will accept them – maybe even for some cash back. Check with your Waste Hauler if they provide pickup for your appliances, most likely to be recycled at the landfill. The EPA’s Energy Star Program also provides a list of special offers and rebates for appliance recycling through manufacturers when you purchase new Energy Star models. If your appliances are still working, check with local charities like Habitat for Humanity’s Restore. They will gladly accept used appliances if they are still in good condition. Sioux Falls Household Hazardous Waste facility– free for Sioux Falls area residents. Thank you for keeping these out of the single stream and keeping recycling running! 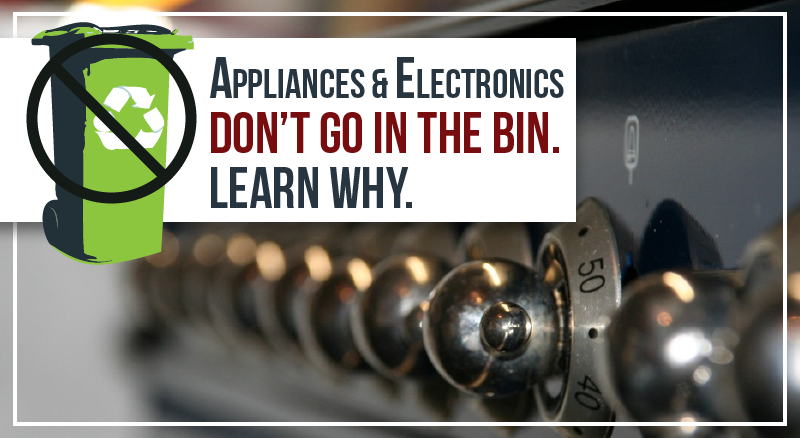 By recycling appliances and electric devices there is an opportunity to help the environment and help others in need along the way. Local recycling programs and charitable donations are simple ways to ensure these items are disposed of properly and sent somewhere where they or their parts will be reused. There are 0 comment. on "Where to take Appliances & Electronics (HINT: NOT MILLENNIUM)"